I have played in venues all over the world. To be honest, they are all special in their own unique way. It is always more than just the walls and the roof that houses any given venue, even though some of those walls and roofs are quite spectacular. What I have found that makes each and every venue special is the people and the energy. The staff; which is almost always made up of a majority of volunteers and of course, the audience. They all contribute to the energy that constitutes a venue. 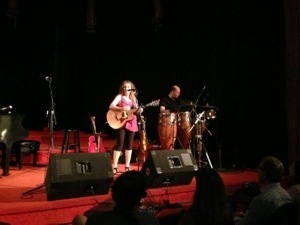 On Friday June 21st 2013 I had the great honor of adding another legendary venue to my list of “places I have played.” I was invited to open for Buskin and Batteau at the Guthrie Center. I only received confirmation about a week and half prior, but since the date also coincided with my Mom’s birthday, it was ringing in my conscious constantly. I already knew the history and the status of this venue going in. It wasn’t intimidating, however I did feel a tremendous sense of responsibility to be “worthy” of such an opportunity. I sent out an email announcement, plastered it all over my social networks, and practiced like crazy so I could walk on that stage with the confidence that I deserved to be there. During the days leading up to the show, my brain was buzzing and I had to keep reminding myself to stay centered so that I could take it all in. It’s so easy to get caught up in the “idea” of an experience that I kind of feel like I sometimes miss the actual experience when it happens. I wanted to truly be there, and take in all that it had to offer. Upon entering, I went in the back door and wound up traveling through the kitchen. I was greeted by many smiling people who were busy as bees preparing food for that evening’s audience. They told me to come on through and to make a left out of the kitchen door. I did. As soon as I did, I felt this instant tingling on my skin. I walked further to the door to the stage aka cathedral, and there it was. In all its magnificence. With it’s red backdrop, its piano aching to be played, and the vaulted ceilings. The energy in the room was palpable. I watched Buskin and Batteau sound check and just knew in my bones that this would be a special evening. When it was my time to soundcheck, I heard David Buskin plucking away at this guitar off to the side. I heard him call out “Hey Marci, do you want me to play with you on this song?” I didn’t even think through a cool response that would sound like it was no big deal that David Buskin wanted to play on MY SONG!!! I squealed back, “Oh my God, YES!!!!! !, REALLY??? OH wow, that would be amazing!!! !” Yes. I am a complete and total dork. I will never be cool. I’m ok with that. After a brief run through, we all ascended upstairs behind the sound person area to this loft-like area that over looked the concert hall. They fed and watered us and I could hear the din of the audience seeping in. Since I have been the person on stage and an audience member I know that there is this electricity that starts to mount when people enter a venue. Even if they are quiet as mice, we still feel it backstage, and I believe it energizes us for when we go and perform. That night I could have taken in a breath and literally launched into outer-space. The electricity was potent. Friends came back for a quick hello and words of encouragement. It’s a little blurry in my mind, but I remember Deb Guhl from WPKN and of course my Capital District contingency Mira Shapiro and Renee Ruggles who drove seven hours to be there in support of this monumental moment in my musical history. I received word that they were about to start the show. I was announced after George Laye did his introduction for the venue and then me. Marshal and I stepped on stage and I went to the piano, said hello to the audience and then invited David up to join us. From the very first note I knew this would be a good night. I can always tell. It’s not that if there’s a funky moment there is no recovering, but there are some nights when you just know that it is going to flow. This night was one of those nights. I was amazed that I wasn’t nervous. That the audience was with me every note of every song. That B&B invited me on stage to sing background vocals a few songs was the cherry on the cake. The night was pure magic and pure joy. It is difficult to explain how I fully believe that not only am I different after each show, but that we all are different. Music is an energy that transcends all rational forms of experience. At least that’s how I feel about it. I feel like the audience is a partner. That they share the responsibility of creating an experience for all of us. That evening was no exception. I am different. I am better having traveled to another special venue that was built by love and passion. I look forward to the next show with full heart and hope. Hope that I can continue to create music and be given the opportunity to share it. I hope the audience feels different too. That going out that night made a difference-a very, very good difference in the quality of the planet. P.S.-if you were wondering about my Mom and her birthday; my parents live down in Florida now so they were unable to attend this show. I am traveling to FL on 7/4/13 to do shows down in their neck of the woods. I am certain they will be there to celebrate!